A few days before my birthday this year, my husband came home and asked me to look up a couple of new restaurants that we’d never been to before. He wanted to gauge my reaction to see if I’d be interested in trying any of these restaurants out. Specifically, we looked at two different restaurants that had several unique and similar aspects. 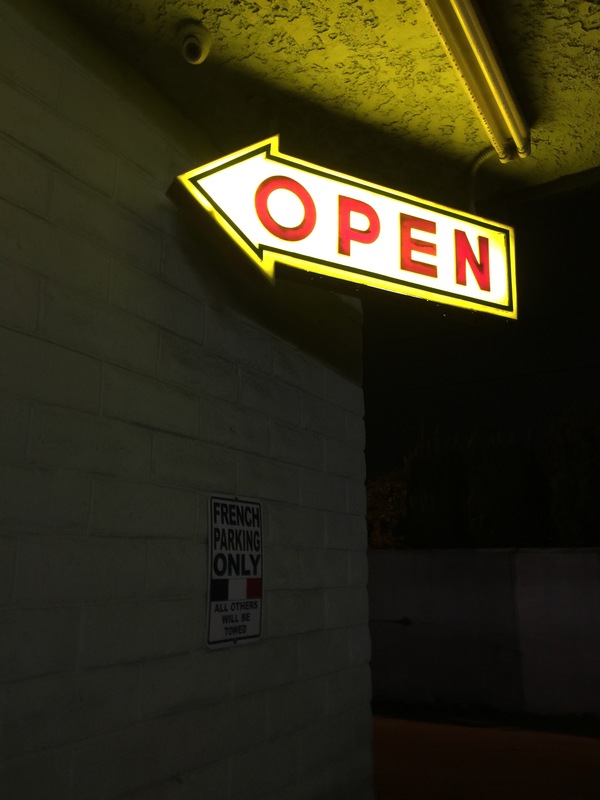 Not only were both restaurants owned by well known celebrity chefs, but they both used a ticketing system to secure your dinner spot, instead of a traditional reservation. In general, on certain days, the ticket system opens up and you can log on to the restaurant’s website and purchase a ticket (generally minimum of 2) for a certain night and dinner seating during that night. The tickets are pre-paid up front, in full. And that ticket secures your seat at the restaurant. In theory, the ticket pays for the meal, tax and service charge so that you’re not responsible for paying for anything at all once you get to the restaurant, as long as you don’t order anything supplemental. For restaurants, this is a great system as they know exactly how many people will be dining at the restaurant each night, and everything is pre-paid for, so they can control their costs and know exactly how much food inventory to order and have on hand for each night. The tickets are non-refundable and once you’ve purchased them, you’re locked in. Some people think this is a brilliant system, and others think it’s rather pretentious. Either way you look at it, it’s amazing just how difficult purchasing tickets can be as they often sell out within minutes of becoming available. One evening, several weeks later, as we were sitting around at home, my husband was putzing around on the Internet and discovered that there was a second way we could purchase tickets to one of the restaurants we were looking at earlier. MasterCard has a “Priceless” program where you can sign up, if you are a MasterCard credit card holder, and it gives you exclusive access to events, reservations, and generally hard-to-get items. Well, on the night he was searching around, there happened to be 2 tickets available for one of the restaurants for the second dinner seating a week later. My husband asked me if I wanted to go and he’d buy the tickets from MasterCard. I figured we should go for it since getting tickets the traditional way seemed to be so difficult. So, with tickets purchased through MasterCard, we got ourselves a dinner date a week later to one of the hottest restaurants in town. Once you step inside Trois Mec, you realize that the restaurant itself is tiny. There’s only a total of 24 seats. Along the back wall, there are tables that seat larger parties. Then up front there’s a counter that has seats essentially looking right into the kitchen. The restaurant has an open kitchen concept and all the dishes are made right in front of your eyes. 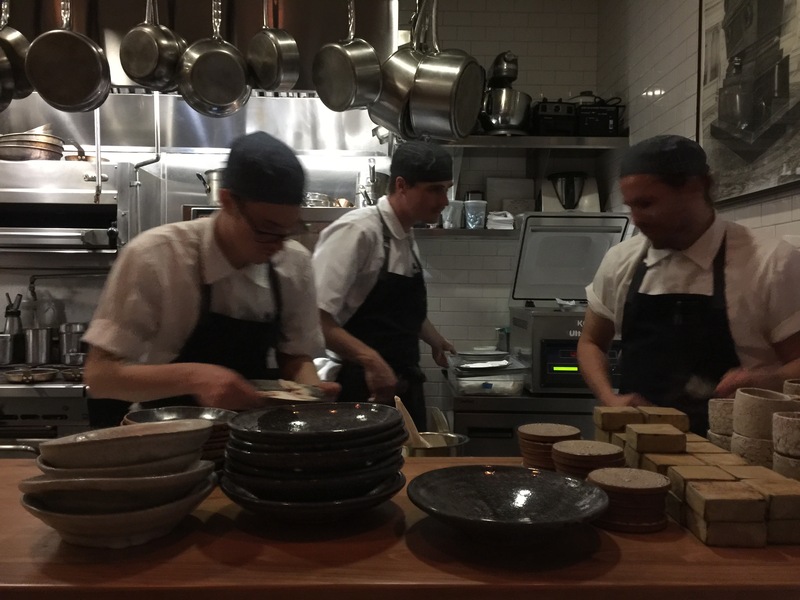 So, if you get a counter seat, you’re basically getting a front row seat into an amazing performance where the chef’s are the actors and the food is the star. The counter seats consists of about 6 upper seats where you’re sitting on a stool, and then next to the door, there’s a lower counter that seats two at a regular height. Those two seats next to the door are the two seats we got for our meal. As soon as you sit down, a waiter comes over, explains out the performance will go for the evening, asks you about a drink selection and then the show stars. 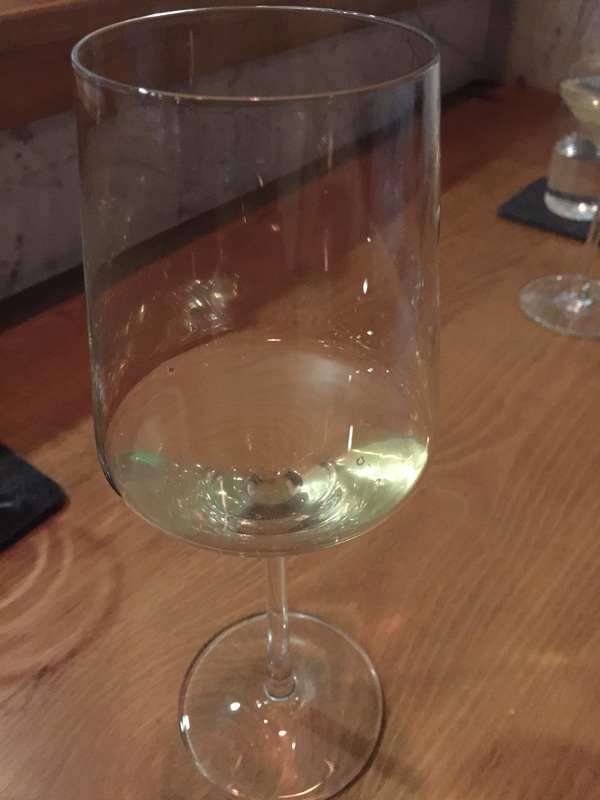 You can order wines by the glass and by the bottle, or you can have a wine pairing where they specifically pair a different wine with each course of the meal. 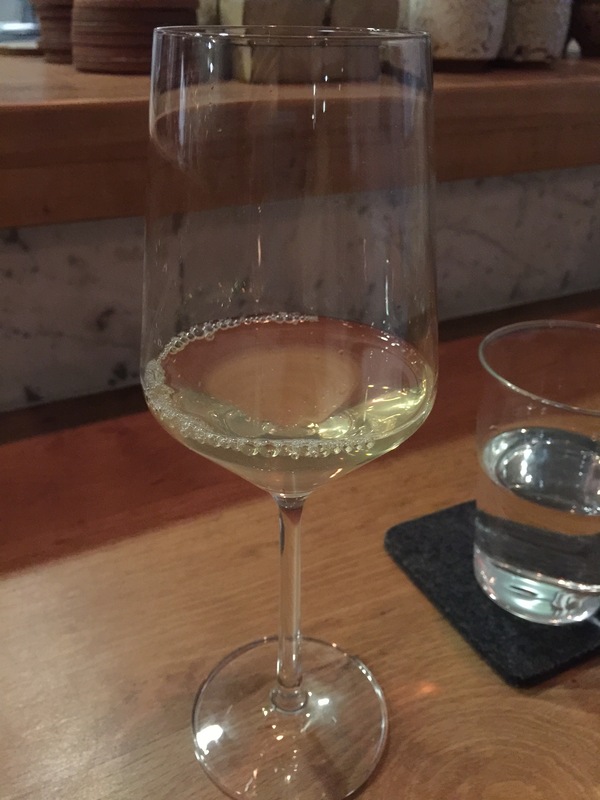 One thing they offered at Trois Mec that I’ve not seen at another restaurant before is a non-alcoholic pairing menu where they offer a variety of home-made non-alcoholic drinks that pair with each course of the meal. I was so excited about this, and my husband decided to do the non-alcoholic pairing menu with me. This was going to be a treat. The first thing that comes out to the table are what are called their “snacks.” These are little few-bite items that are meant to be the appetizer or the warm-up to your meal. 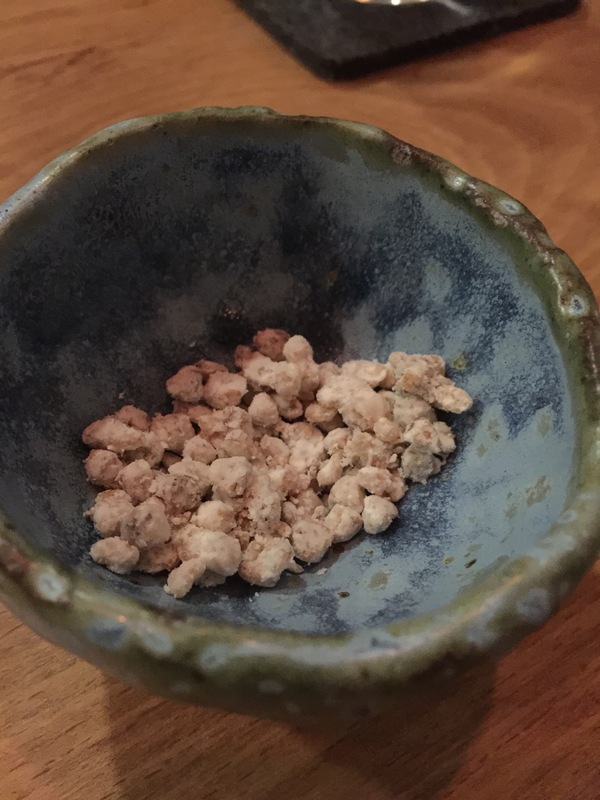 The first “snack” we received was the buckwheat popcorn, which is a signature of the restaurant. The buckwheat popcorn is made with puffed buckwheat and vinegar. This was so unexpected and unlike anything I’ve ever tried before. I wasn’t really sure what to expect with buckwheat popcorn, but it really was like a puffed rice. The vinegar punch from the puffed buckwheat is really what makes the dish. The puffed buckwheat is crunchy and the vinegar packs the zing to add the needed flavor to the buckwheat. It was like awesome goodness packed into a small bite. The next snack was the potato consumme. Essentially a potato soup (but without the potato). The broth is made from potatoes and it’s flavored with lemon thyme and brown butter. Served in a little tea cup, this is essentially a soup of a couple of sips. After one sip, you could really taste all of the components of this dish. The potato flavor comes through clearly, then there’s the earthiness of the lemon thyme and then the richness of the brown butter. It’s this brown butter that really brings the whole dish together and makes it cohesive. At this point, we were served our first drink from the non-alcoholic pairing. The drink was a sparkling limeade. We were told that all of the non-alcoholic drinks were made in house, which was a bonus because they really thought about the flavors and tastes and how it would pair with everything we were being served. The limeade was not too sparkly and really quite tasty. A good start. The next snack, of which there were 5 in total, was the crispy tapioca with passion fruit. 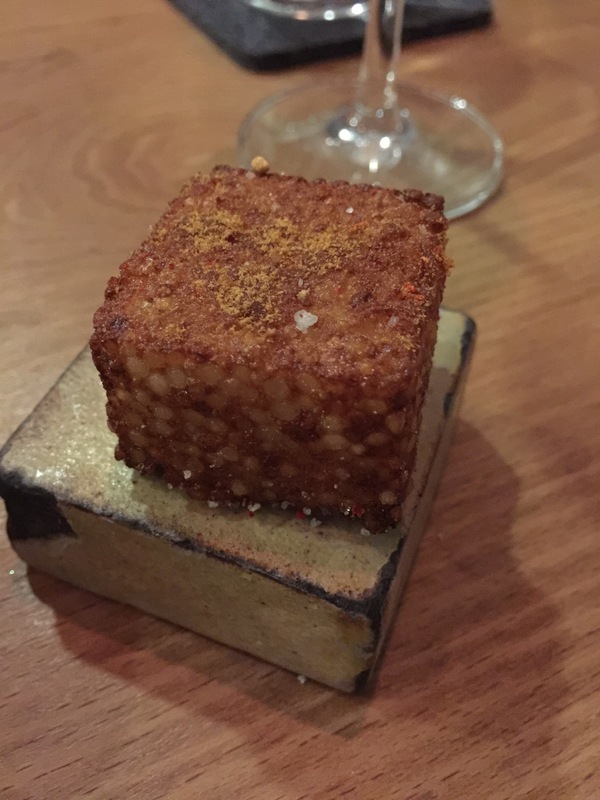 This comes out looking like a deep fried cube and you’re not quite sure what’s inside and how it’s going to taste. When we were told it was tapioca, I was skeptical. 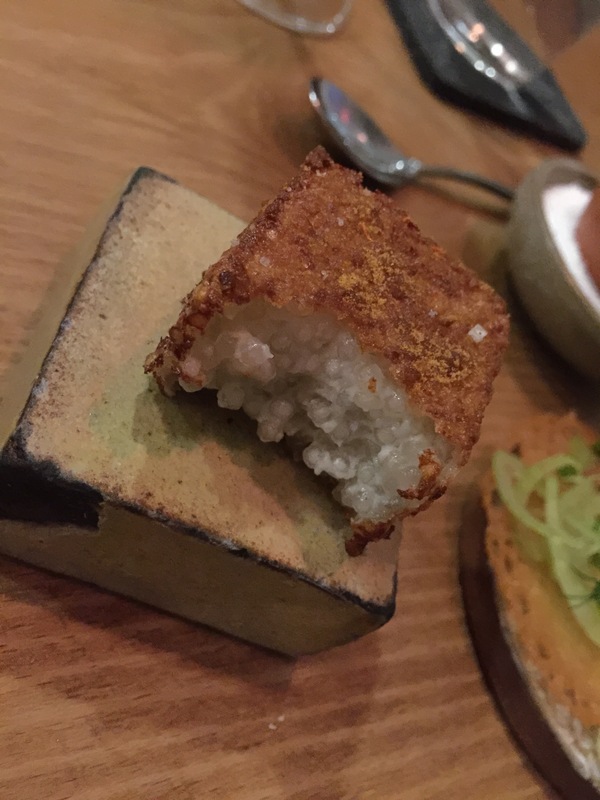 How could deep fried tapioca really taste like anything since tapioca is pretty bland on its own, and how would frying it in the shape of a cube effect the flavor of the tapioca? Boy was I surprised. This cube of goodness was crunchy and tart. The passion fruit flavor shines through in the tartness and the tapioca gives the dish the volume and depth and surprisingly more flavor than I ever thought possible. This dish was quite surprising and unexpected. Chickpea sorka with fennel, scallions and olive oil was the 4th snack of the evening. The chickpea was baked to almost resemble a parmesan crisp, which was really neat. I was a bit wary of this dish as the combination of chickpea and fennel didn’t really sound all that appetizing to me. But, I should have known better after the previous snack, to expect the unexpected. The flavor of the snack was outstanding. The chickpea added a great crunch and the fennel mellowed it out and added just that hint of licorice flavor. The olive oil added some depth and body to the dish and the scallions gave it that slight onion hint which rounded out the dish. This was really good, and I have to admit that the fennel really was quite delicious in this dish. The last snack was my absolute favorite. It was egg hot and cold. 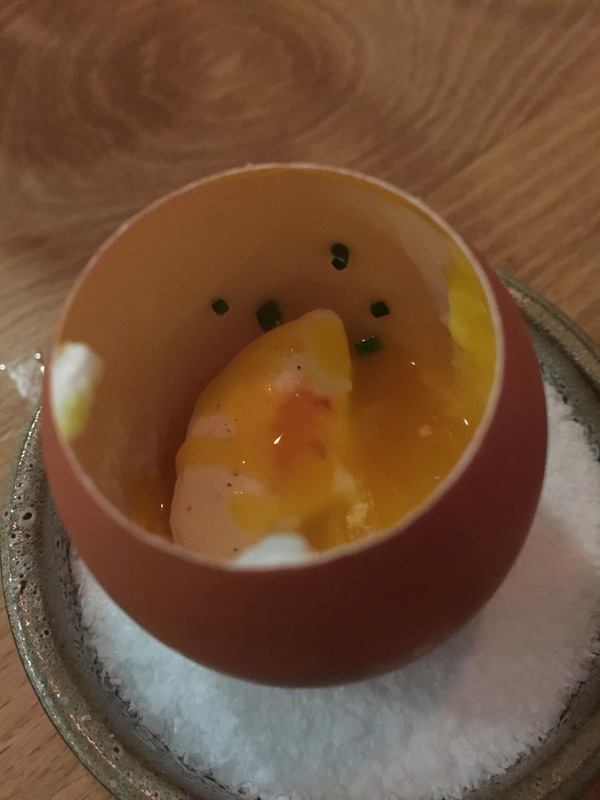 Served inside an egg shell, it is essentially a poached egg yolk topped with whipped cream and sherry vinegar. Ok, this sounds weird, especially the whipped cream part, but believe me, this was amazing. That’s the only way to describe this. The whipped cream was actually, in fact, whipped cream without the sweetener. 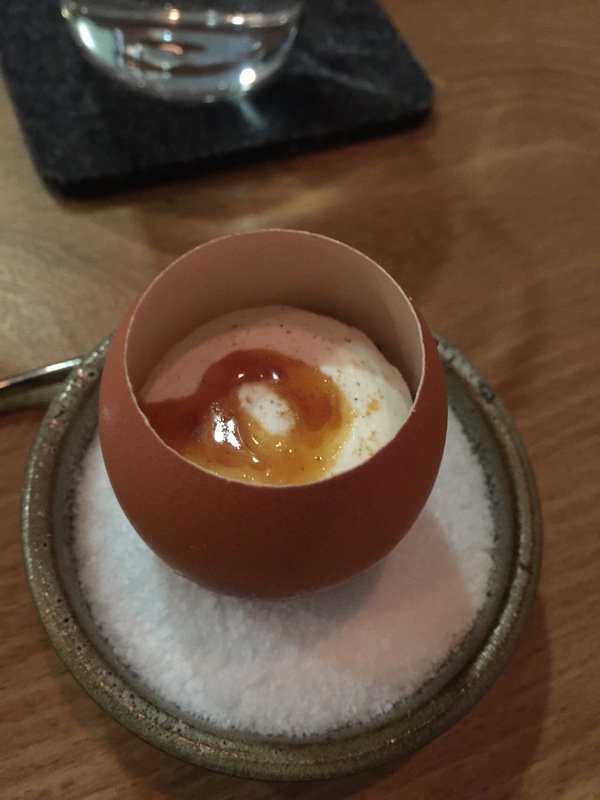 The idea is to take the tiny spoon they give you and dig right down into the egg shell where the poached egg yolk is, and scoop up a bit of the creamy egg yolk, the fluffy whipped cream and the sherry vinegar all into one bite. What you get is this warm egg yolk which is rich and creamy, combined with this cool whipped cream and the zing of the sherry vinegar. You could definitely taste each and every component of this dish and it was amazing. The egg was super creamy and delicious and just incredibly awesome. I could have had two of these hot and cold eggs. I loved the creativity of the dish, and yet it was so simple with very few ingredients. Before moving on to the next food course, we were presented with our next non-alcoholic drink pairing. 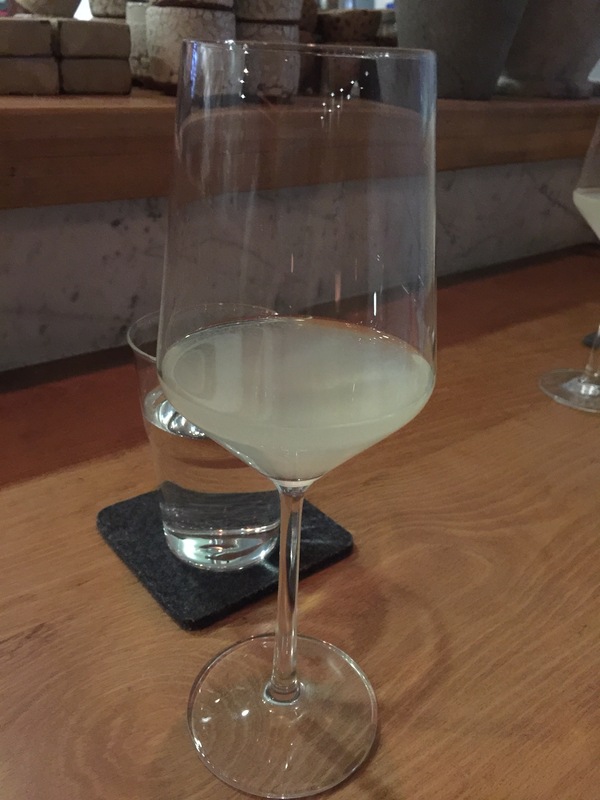 This time, the drink was elder mint soda. I thought that I wouldn’t like this one, but I was surprised. The drink was light, almost like an apple cider but with a little bit of a kick from the elder mint. It was surprisingly refreshing, and much better than I had anticipated it to be. Our next food course was carrot tartare. Presented and treated much like a beef tartare would be, but done in a vegetarian-style using diced carrots. 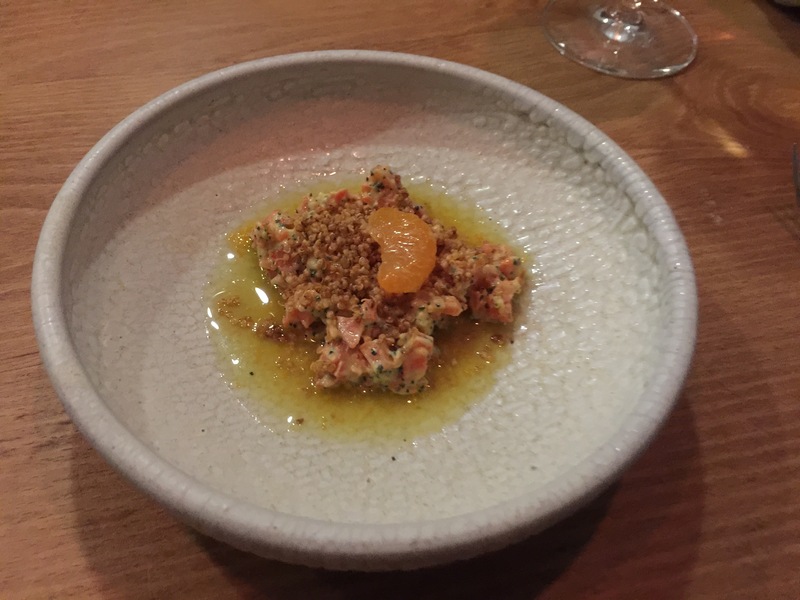 The carrot tartare was flavored with citrus, puffed quinoa, cumin and served along side a fresh baked baguette. The dish had a great flavor and zing to it. The puffed quinoa was interesting and the combination of the citrus and the cumin was unique. Both spices really added flavor notes to the carrot tartare. This was such a unique and creative dish, and the fresh baguette to go with the tartare was a perfect accompaniment. 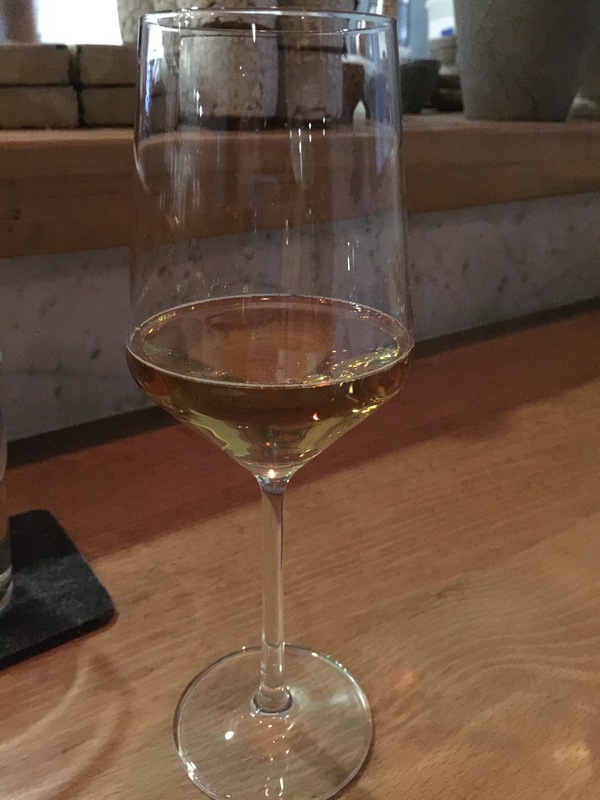 Our next drink pairing was a ginger ale, but homemade. The ginger ale really packed a bit of a punch. This was much stronger than normal ginger ale. To appreciate it and enjoy it, you really needed to be a fan of ginger and be able to handle a bit of the ginger bite. This was different and unique, that’s for sure. Now, the next food course absolutely blew my mind. I’d never ever heard of this pairing of flavors before and I wasn’t quite sure what to expect from it all. 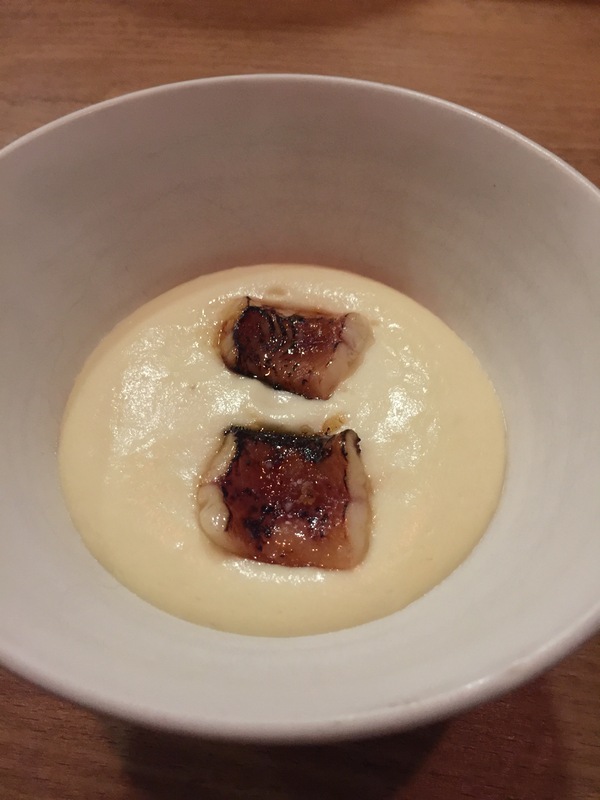 The dish was served in a bowl and inside was white chocolate potato souffle topped with a caramelized eel. The surprise was that at the bottom of the bowl was cubed Granny Smith apples. First off, let’s start with the white chocolate potato souffle, essentially, a fancy way of saying white chocolate mashed potatoes. Who puts white chocolate into a potato puree? Potato puree can already be pretty sweet but add white chocolate to that and how will that work? But amazingly it was absolutely brilliant. The potatoes were incredibly creamy and smooth, but you could definitely taste the sweetness of the white chocolate throughout the potatoes. They weren’t trying to hide the flavor at all. The caramelized eel was amazing, and this was the first time I’d ever eaten eel before. The eel had a great smoky flavor to it, and the meat was tender. The combination of seafood with potatoes is a bit different, but it really worked. What really pulled this dish together though was the Granny Smith apples. The tartness of the apples really cut through the sweetness of the potatoes and it gave the dish the crunch it needed to balance out the light eel and the creamy potatoes. These are three completely different ingredients that I would never in a million years imagine would go together, and yet, put them in a dish together and they just work. This as my favorite dish of the night. 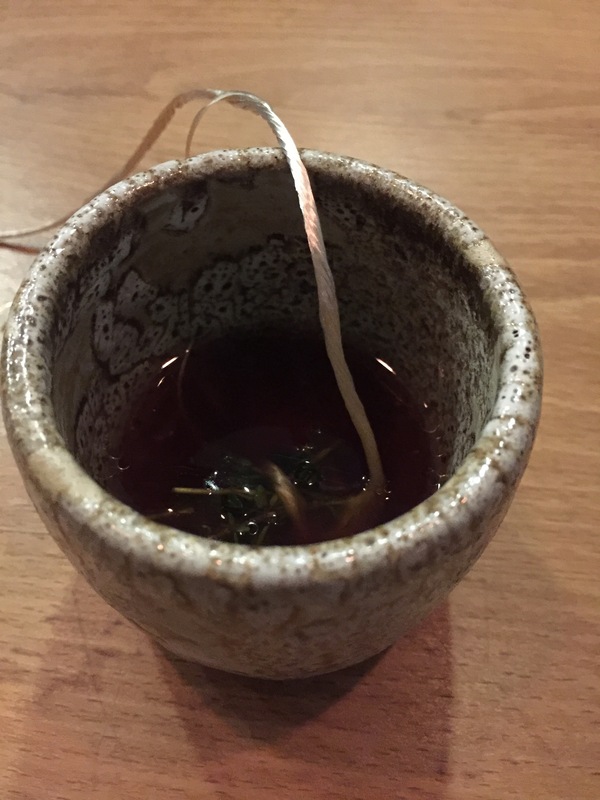 Before our next food course was brought out, we were given a tasting of a drink called mountain shrub. The drink was different, and our waiter warned us in advance that it was a bit odd, but it was his favorite of the non-alcoholic drinks. Made with a combination of pine, vinegar and soda, the drink really did smell like a pine forest. It was interesting to smell the unique pine scent, it and it sort of transported you into the woods. But pine needles with vinegar? Wow, that was different. I was surprised that you could actually taste the pine in the drink, there was just a light hint of it. The vinegar taste was there as well, but not so strong, it was a complimenting note to the woodsy pine. The soda just added a brightness and effervescence to the drink. The next dish course was a dish of sushi rice topped with a grilled king crab leg, uni butter, avocado and leche de tigre. The dish was tangy, something I wasn’t quite expecting, but now I see why the mountain shrub was paired with this dish. 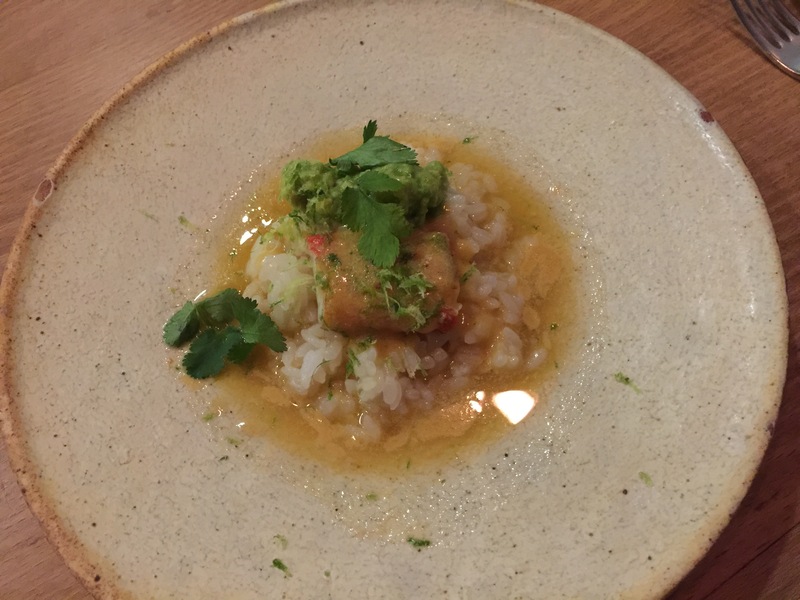 To really get the flavor of the dish, you really needed to get a taste of everything in one bite, a little bit of the cool, refreshing avocado, the sweet sushi rice and the smoky crab leg. Together in one bite, it was delicious and very flavorful. The sushi rice is perfectly prepared and the crab legs were sweet and flavorful. The avocado is a great balance of flavors and compliments the uni butter and just cools down the whole dish a bit, which is nice. If we thought that our last drink pairing was different, this next one was quite different as well. 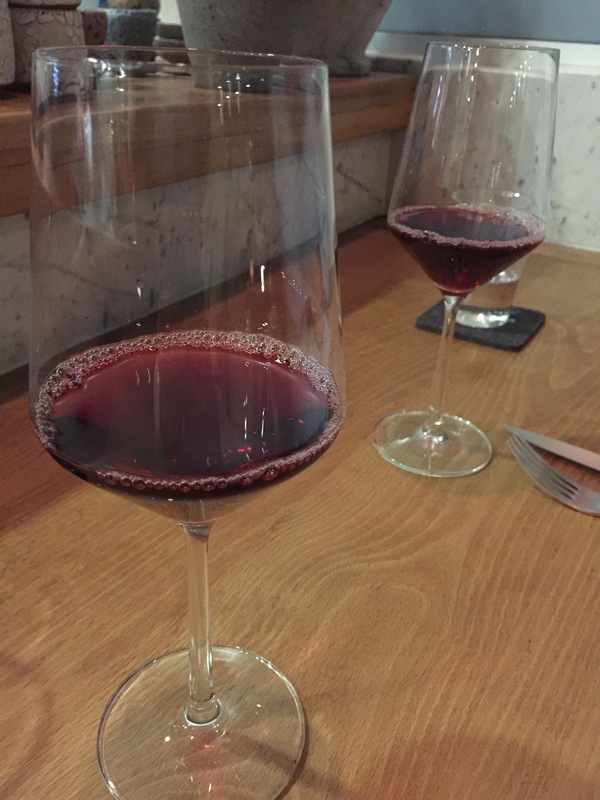 Essentially, the drink was a pomegranate rose vinegar tonic which was made to look like a pinot noir. As the next course was a meat dish, red wine seemed fitting. The drink was definitely different. While I could taste the pomegranate, the flavor that was most prevalent was the vinegar. The tonic water made the drink a bit bubbly, and the rose gave the whole thing an interesting flavor. But, I think in the case of this drink, where the vinegar worked in the mountain shrub, the vinegar being so strong in this drink just didn’t really work as the other flavors just didn’t compliment the vinegar that well. 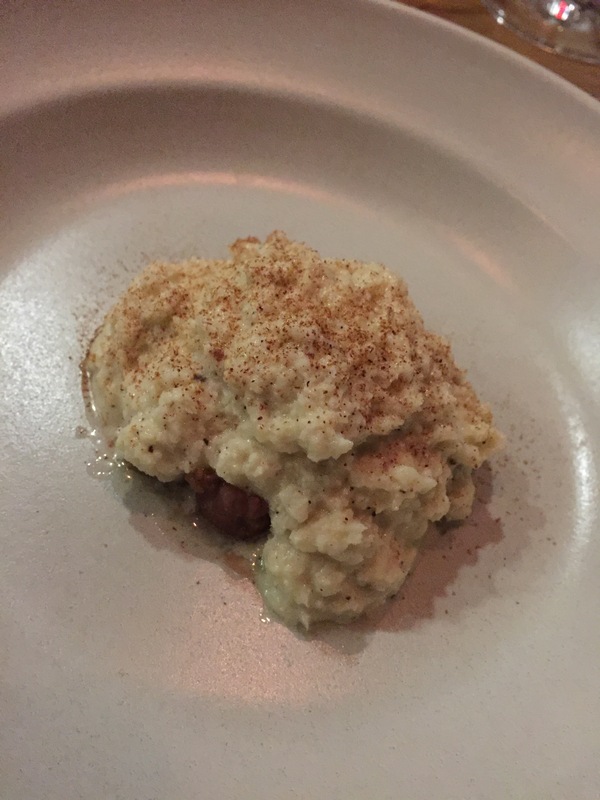 Our meat dish of the evening was veal topped with cauliflower porridge, cinnamon and dates. This was different and interesting. My husband really liked the dish more than I did. While I thought that the individual components were fantastic, together, the cauliflower porridge over the veal was a bit odd. The cauliflower porridge itself was unique, but flavorful and much better than I had anticipated it would be. The spice and heat and flavor of the cinnamon is noticeable, and while I’m not a fan of dates, the dates in this dish weren’t so bad. They were mixed in with the veal underneath the porridge, so I never knew if I was stabbing my fork into a date or veal. The dates added a bit of sweetness to balance out the cauliflower. The veal itself was tender and flavorful. The smoked veal was really smoky and I loved that smoke flavor and aroma. However, for me, the cauliflower and the veal together was just a texture combination that I’m not sure I enjoyed all that much. My husband, on the other hand, who isn’t a cauliflower fan actually commented on how much he liked the cauliflower in this dish. To each his own, I guess. That was the last of the meal itself, it was now time for the dessert course. 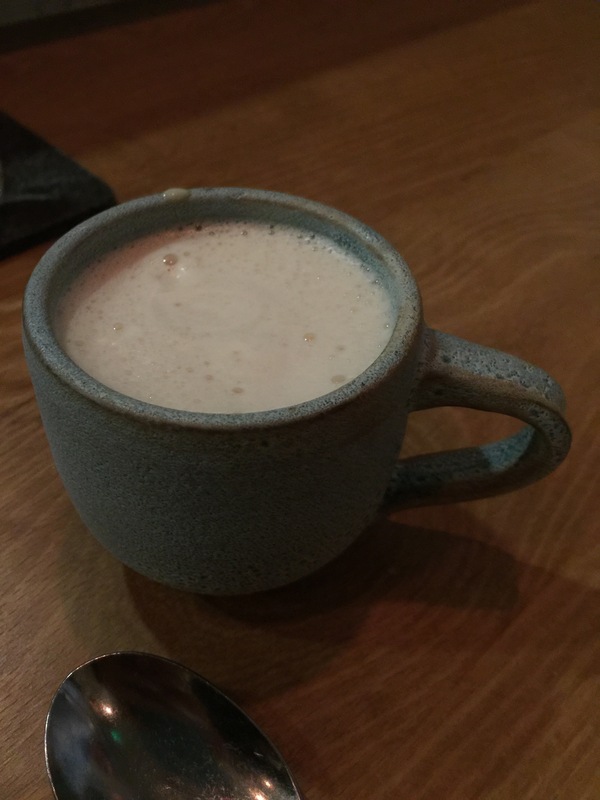 To drink with our desert, we were presented with a chai latte. Again, tea is not generally my drink of choice for any course, but the chai latte actually wasn’t so bad. The frothiness of the drink almost made me forget that it was tea. Surprisingly, while it didn’t really seem like we were served that much food, it was the right blend of course and size of dishes. I was, surprisingly, getting quite full by this point, so dessert was a good thing. I’m not quite sure I could have eaten more food. Our dessert was something called a “mont” blanc. 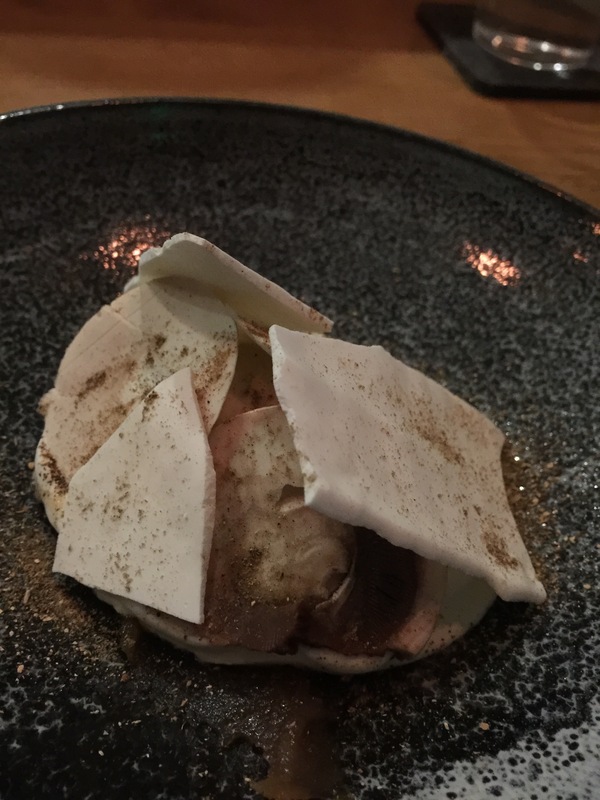 Made with vanilla and chestnut ice cream, meringue and sliced button mushrooms and then dusted with “forest powder,” the dessert was definitely unique. Now, as we were sitting at the counter, I could see one of the chefs thinly slicing button mushrooms, but I couldn’t quite figure out what dish the mushrooms were in. Once we were presented with the dessert, now I knew. Um, mushrooms in my dessert, really? I don’t like mushrooms. But my husband told me to have an open mind and give it a try. You know what? It was surprisingly good. If I hadn’t know in advance that it had been sliced mushrooms, I never would have guessed. The ice creams, both made in house, were creamy and delicious. The meringue was crunchy and airy and provided an interesting texture to the dish, as well as adding sweetness. The mushrooms actually paired quite well with the ice cream as they were smooth and added a woodsy flavor that went well with the chestnuts. The dessert was visually appealing, and I never ever thought that I would eat mushrooms in my dessert, or really in any form, but I was shocked and just how unique, different, and good it was. As if I wasn’t already stuffed, we were presented with some petit fours to round out the meal. Each of us got our own dark chocolate avocado truffle with pecan and almond pastry choux with slivered almonds and almond cream pastry. My husband was a bit skeptical about the dark chocolate avocado truffle as he’s not much of an avocado fan, but this was different and unique. 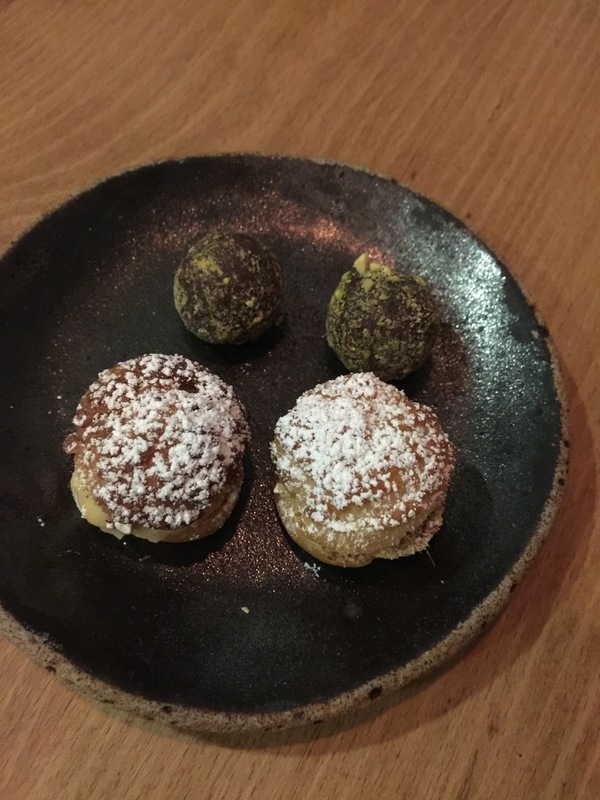 While you could kind of taste the avocado, it was more being able to tell that the creaminess and richness of the truffle came from the avocado. The dark chocolate was slightly sweet and slightly bitter which just made the whole thing go down so smooth and the bits of pecan just added some crunch to cut through the richness of the truffle. The almond pastry cream puff was delicious as well, though it ended up tasting a bit like marzipan. If you’re a marzipan fan, you’d like this cream puff, and if not, you probably wouldn’t. The cream puff was definitely almond flavored from the almond pastry to the slivered almonds to the almond cream filling. Ok, seriously, but this time, i was stuffed to the gills. I don’t think I could have eaten anything more. At this point, we thought this was the end of our night. Our bellies were stuffed with good, creative food and exquisitely crafted non-alcoholic drinks. 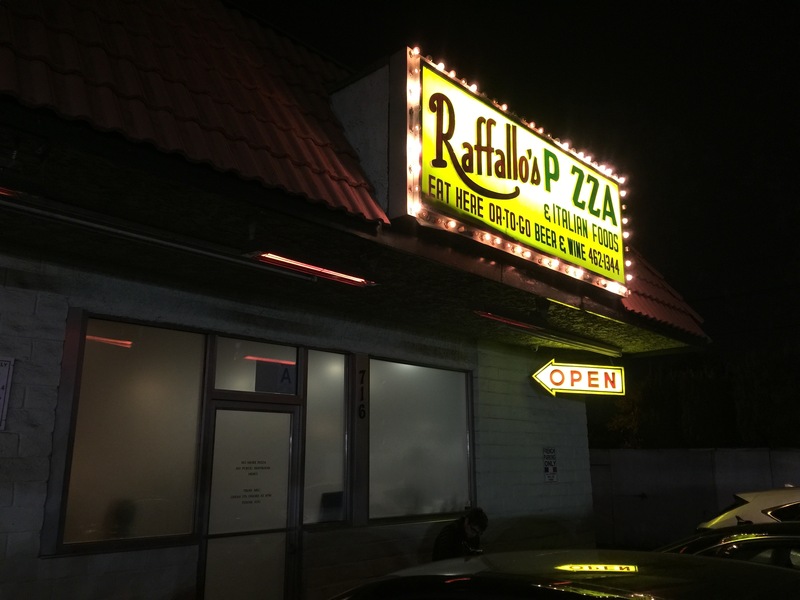 We were completely satisfied with the meal and had no complaints whatsoever. However, our waiter presented us with a surprise. 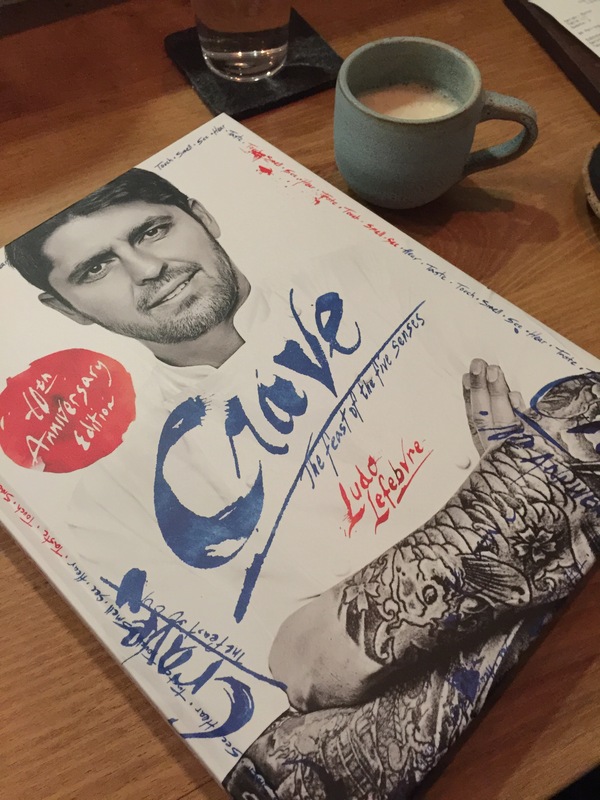 As part of the MasterCard “Priceless” program we were also given a copy of Chef Lud’s book “Crave” signed by Chef Ludo himself! Wow, that was completely unexpected. Additionally, everyone in the restaurant is given a copy of the night’s menu so that you can re-live the memories of the wonderful food that was presented to you. After all, remember, there is no menu here, and other than the descriptions given to you by the chef’s when the food is presented to you for each course, you have absolutely no idea what you’re eating. So having a souvenir menu is a great way to remember this visit to Trois Mec. 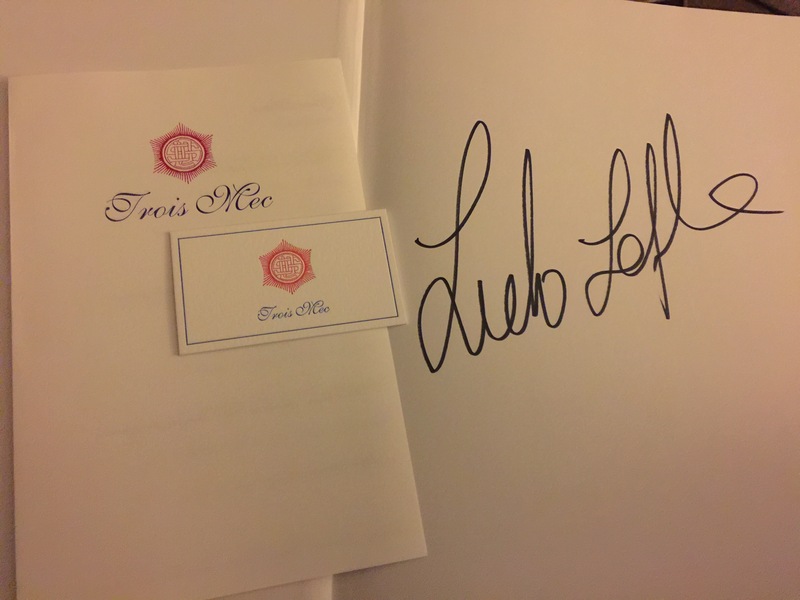 But, having a signed copy of a book by Chef Ludo makes this trip to Trois Mec absolutely “Priceless”! That was such a terrific surprise, we couldn’t have been any happier! Trois Mec is such an incredible dining and food experience. I admit that as much as I love food, I was a little nervous to go to Trois Mec. Walking into a restaurant experience where there is no set menu for you to choose from and you’re just supposed to eat what’s presented to you is a bit daunting to me since I am definitely a picky eater. But remarkably, once I stepped inside and we were seated right behind the open kitchen, all my worries faded away. While I was presented with food items I’d never tried before, such as eel, or items I don’t like to eat, such as mushrooms, I actually loved every single morsel of food and drop of liquid we were presented with. In fact, my husband and I just couldn’t get enough. And by the time we walked out of the restaurant, with our signed Chef Ludo cookbook in hand, we were so stuffed and yet as giddy as a kid in a candy shop. I would highly, highly recommend the Trois Mec food experience to anyone who wants to have a good time, a little fun and try something different. You won’t be disappointed. ← Maple Block Meat Co. Awesome! That is good to hear. My husband’s friend’s restaurant has a tasting menu where it is like this: you get what they make on that day. It comes in carnivore and herbivore, and I’ve always wanted to try it (herbivore), but I’m picky, too, so I am a little scared. Now I think I should just go for it! You should. This is the second time I’ve done a restaurant like this – first one was in Paris – where essentially you go in blind and have no idea what they are going to serve you. I am ultra picky with food too, but both experiences have been amazing and wonderful and I didn’t have any issues with any of the food they served, so it turned out well. It’s kind of adventurous, even though I don’t like adventurous when it comes to my food!